FILE - Then-White House National Security Adviser Michael Flynn, center, arrives at the White House in Washington, Feb. 13, 2017. President Donald Trump's former national security adviser appears to have violated federal law by not properly disclosing payments he received from foreign governments for public engagements, the heads of the House Oversight Committee told reporters Tuesday. The rare show of bipartisan consensus on Capitol Hill came after the White House denied the committee's request for documents relating to retired Lieutenant General Michael Flynn's contact with foreign nationals. "As a former military officer, you simply cannot take money from Russia, Turkey or anybody else — and it appears as if he did take that money," said House Oversight Committee Chairman Jason Chaffetz, a Utah Republican. House Oversight Committee Chairman Jason Chaffetz, right, a Utah Republican, and Rep. Elijah Cummings, a Maryland Democrat, speak about the failure of former national security adviser Michael Flynn to disclose payments for a 2015 speech in Moscow. The White House responded Tuesday by saying it didn't know whether Flynn had broken the law in the course of making contact with and receiving payments from foreign governments. Press secretary Sean Spicer downplayed claims that the White House had denied the request, saying the committee had received all the documents it needed from other agencies. "Right now, to ask the White House to produce documents that were not in the possession of the White House is ridiculous," Spicer told reporters. After an hourlong classified briefing, Chaffetz said he had seen no evidence Flynn complied with the law. Representative Elijah Cummings of Maryland, the committee's ranking Democrat, said Flynn's contacts were "a major problem." He added that the matter would now most likely fall under the purview of the House Intelligence Committee. "Somebody else will determine whether or not he's guilty," he told reporters after the news conference. The lawmakers said Flynn would have needed permission to deliver a paid speech at a gala sponsored by the Russian-funded television station RT in 2015, where he sat at the same table with Russian President Vladimir Putin. Flynn received $45,000 for that appearance and more than $500,000 for lobbying on behalf of the Turkish government. Cummings and Chaffetz said it appeared Flynn did not seek or receive the required permission and could be prosecuted for failing to do so. "The statute's real clear. You have to seek and get permission," Chaffetz told reporters after the briefing. "It's a pretty high bar. But it appears as if he didn't even try to do that and jump over that bar." Cummings told reporters, "I do believe we are in a struggle for the soul of our democracy, and that concerns me." FILE - Retired U.S. Army Lieutenant General Michael Flynn stands by the elevators as he arrives at Trump Tower in New York. According to the lawmakers, the committee asked the White House for information about any efforts Flynn made to obtain permission for those payments, the former adviser's applications for security clearances and documentation of funds he may have received from foreign sources. The White House referred the committee to the Department of Defense for information about Flynn's security clearances. Marc Short, Trump's director of legislative affairs, said the White House did not hold material predating Flynn's service as national security adviser. Asked whether Flynn had violated federal law, Spicer told reporters Tuesday, "That would be a question for him. I don't know what he filled out," referring to Flynn's responses to questions on federal security documents. Flynn was forced to leave the White House after lying to Vice President Mike Pence about his conversations with Russian Ambassador to U.S. Sergey Kislyak during the period before Trump officially took office. Senate Minority Leader Chuck Schumer, a New York Democrat, said the newest Flynn allegations were "extremely troubling" and called for an investigation into the matter. FILE - Then-Deputy Attorney General Sally Yates speaks during a news conference at the Justice Department in Washington, June 28, 2016. Meanwhile, the Senate Judiciary Committee announced Tuesday that former acting Attorney General Sally Yates and former Director of National Intelligence James Clapper would testify at a May 8 hearing on Russia's meddling in last year's U.S. presidential election. Yates and Clapper are also expected to testify at a public House intelligence panel hearing sometime after May 2, the date FBI Director James Comey is scheduled to appear before the committee in a closed session. Last month, Comey acknowledged that his agency was investigating whether members of Trump's campaign had colluded with Russia to try to influence the election. U.S. intelligence agencies have concluded Moscow intervened to try to influence the election in Trump's favor. 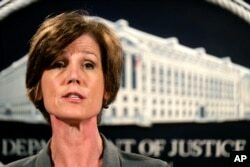 Yates, who was dismissed by President Donald Trump in January after refusing to defend his travel ban, was scheduled to testify before the House panel weeks ago about phone calls between Flynn and Kislyak. FILE - House Intelligence Committee Chairman Rep. Devin Nunes, R-Calif., right, accompanied by the committee's ranking member, Rep. Adam Schiff, D-Calif., talks to reporters, on Capitol Hill in Washington. That hearing, however, was postponed by House Intelligence Chairman Devin Nunes, a California Republican. 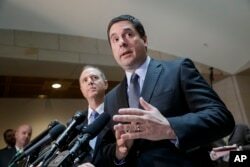 Nunes recused himself from the investigation two weeks after telling reporters that classified reports showed Trump associates had been caught up in U.S. government surveillance of foreign officials during the presidential transition. Nunes then hurried to the White House to brief Trump on the findings, prompting Democratic criticism that Nunes had become too close to the president to oversee an independent investigation.